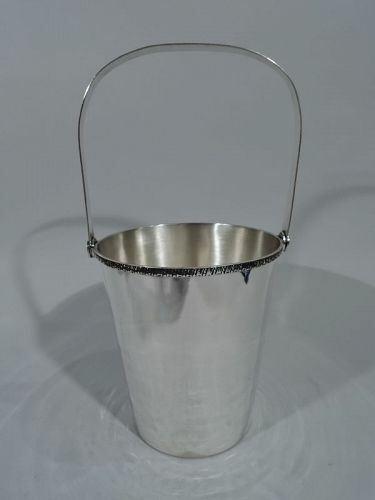 Midcentury Modern sterling silver ice bucket. Retailed by Cartier in New York. 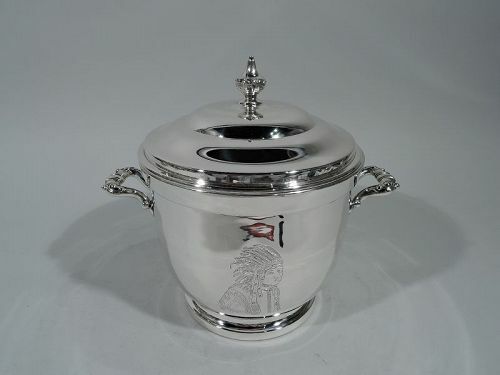 Urn with double-scroll side handles and stepped foot. Raised and reeded cover with finial. Bucket interior insulated. Fully marked including maker’s and retailer’s stamps. 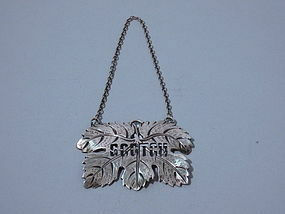 The maker was Worden-Munnis, which was active in Boston ca 1940-1964. Numbered 50. Good condition. 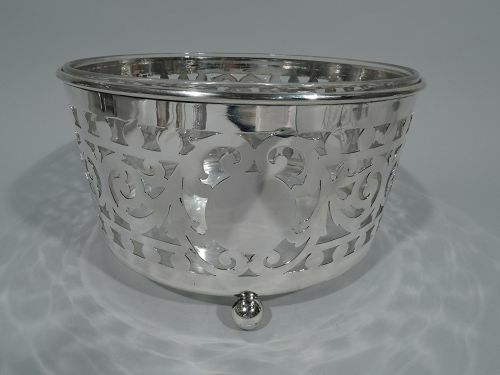 Large Edwardian sterling silver ice bucket. Made by Gorham in Providence in 1909. Round with straight sides and 4 ball supports. Pierced beading and scrollwork. Two oval frames (vacant). Detachable clear glass liner. Fully marked including maker’s stamp, date symbol, and no. 402A. Very good condition. 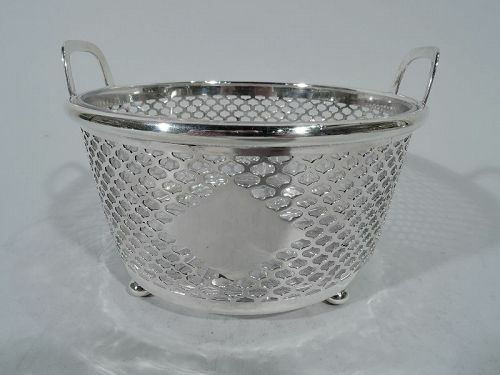 Turn-of-the-century cut glass and sterling silver ice bucket. 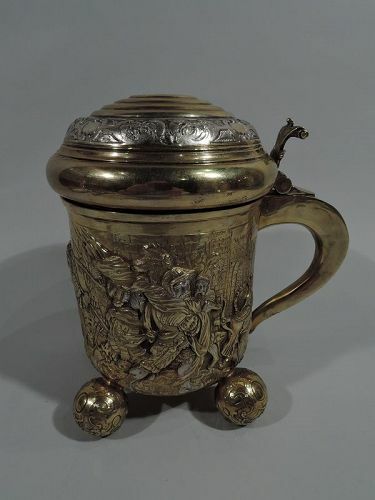 Made by Wilcox Silver Plate Co. (a division of International) in Meriden, Conn. 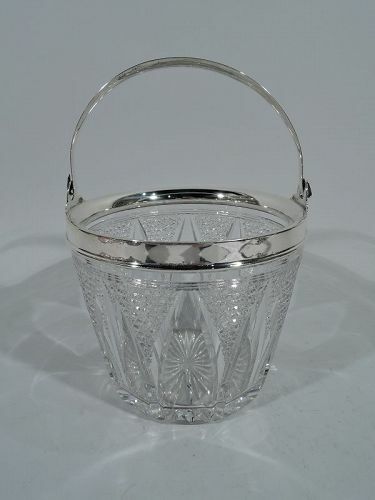 Round clear glass with band of stylized leaves, and diaper triangles with facets and starts. 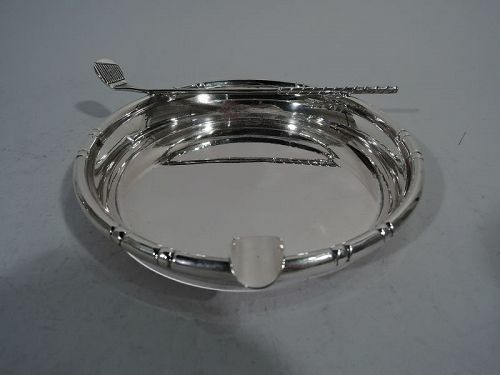 Sterling silver collar with c-scroll swing handle. Hallmarked. Very good condition. 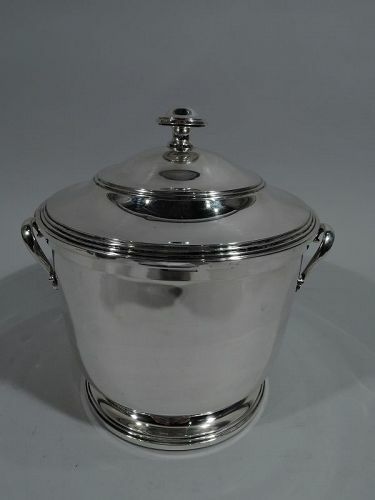 Edwardian sterling silver ice bucket. Made by Tiffany & Co. in New York. Straight and tapering sides with open bottom, 4 squashed ball supports, and 2 bracket handles mounted to rim. Sides have web-style piercing. Lozenge-form cartouche (vacant). Detachable clear glass liner. Hallmark includes pattern no. 17194 (first produced in 1908) and director’s letter m (1907-47). Good condition with minor unevenness on underside. 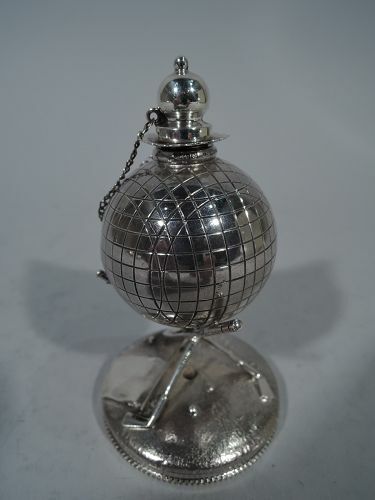 Sterling silver cigar lighter. Made by Reed & Barton in Taunton, Mass., ca 1920. Golf ball bowl with chained ball cover and threaded wick. Ball mounted to cradle comprising two crossed clubs mounted to raised and beaded circular base. An iconic design for the sybaritic sportsman. Hallmark includes no. 85. Very good condition with deep patina. 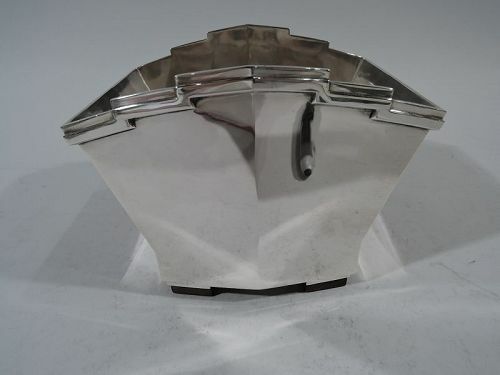 Art Deco 950 silver ice bucket. Made by Tetard Freres in Paris, ca 1930. Trapezoidal with applied rim and two rectangular supports mounted to stained-wood. Sides gently convex with fashionable skyscraper motif. Fully marked with Minerva head and maker’s mark. Very good condition.